Bolt Farm Luxury Treehouses was named the Most Popular Airbnb in South Carolina by BuzzFeed, featured in Architectural Digest, The Knot, Only in Your State, and is named among the top treehouses in the South. The Bolt family is 13x Airbnb Superhosts! "Rustic charm meets Victorian romance in this Instagram-ready retreat in South Carolina. Located on an eco-friendly property, on 40 private acres of farmland and woodlands..."
"A treehouse that feels more like a palace." "...We had the honor of staying in the Bolt Farm Treehouse that Seth built in Walhalla, South Carolina. My goodness this place is so dreamy, cozy, romantic and inspiring. 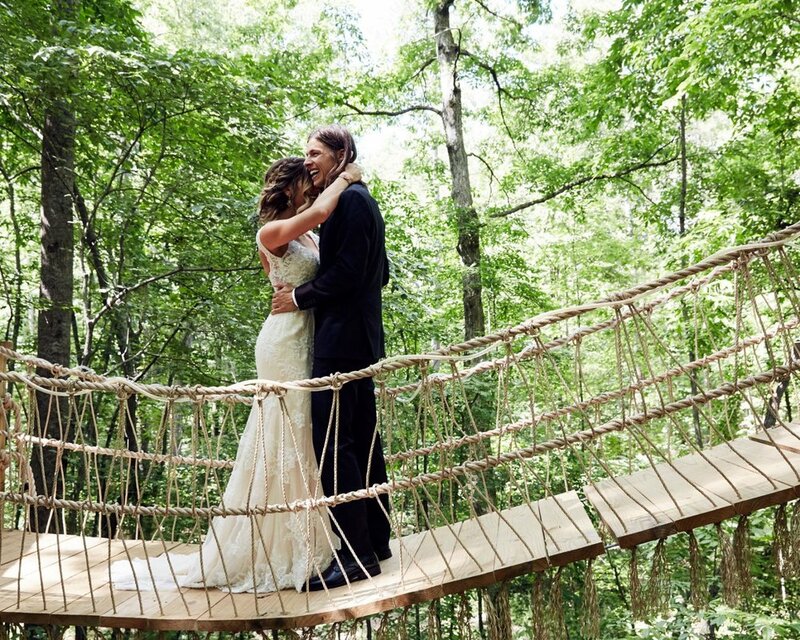 We danced a little, cuddled a lot, and dreamt of one day building our own livable treehouse on Roloff Farms." "...The bride and groom exchanged vows in an outdoor wedding ceremony held at the groom’s childhood home in South Carolina. "It's more than just a place to stay, it's a full experience." "Whether you’re making it a romantic weekend getaway or you’re taking a solo retreat for inspiration and meditation, the luxury treehouse at Bolt Farm is an unforgettable hideaway to make the magic happen." "Located in the small town of Walhalla, near the beautiful Blue Ridge Mountains, this incredible treehouse lies on a 40 acre parcel of land. Surrounded by incredible scenery, this unique spot is a great place to enjoy a relaxing vacation." "Seth spent months salvaging barn wood, antique windows and hardware to build, by hand, the best wedding gift his bride could ask for…. a honeymoon treehouse." "This stunning glamping treehouse rental is nestled amid 40 private acres of farmland and woodlands."